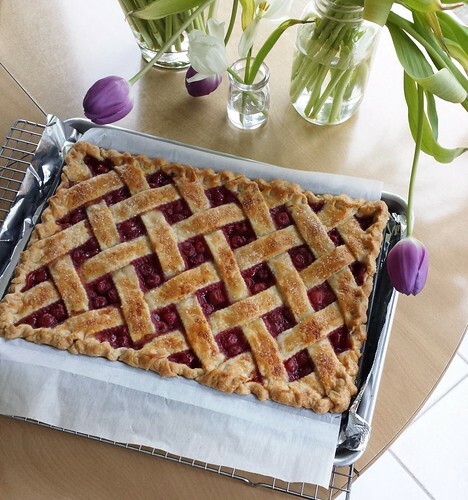 I encored my popular Sour Cherry Lattice Slab Pie. That was an obvious choice since it is delicious, beautiful, and easy to slice. Besides, who doesn’t crave summer cherries when it is cold and dreary outside? I also found an excuse to use my newly purchased French tart ring. I longed to buy a tart ring for years. It is widely used in many professional pastry cookbooks and I wanted to find out for myself if it is really worthy of the hype. 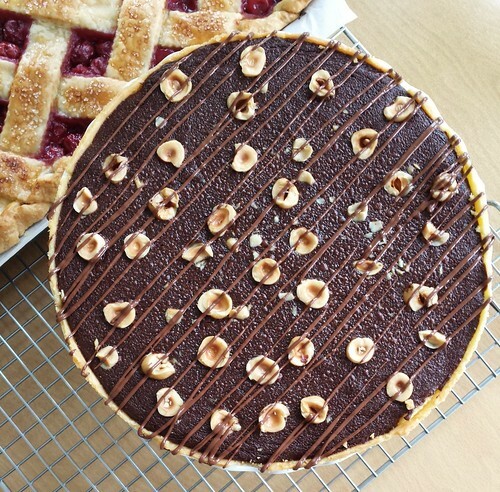 I turned to a tried-and-true recipe from Pierre Hermé, Nutella Tart with Baked Ganache. The tart turned out quite nicely with cakey baked ganache layer that I love. As for using a tart ring, I think I need more practice before making judgement on how well it works. Just for shiggles, I brought a mochi chocolate cake baked in the shape of the letter pi. The pi plate was a gift from a friend and I felt the need to use it at least once a year. Last year I used it for cream cheese peanut butter pie topped with shaved chocolate and candied peanuts. 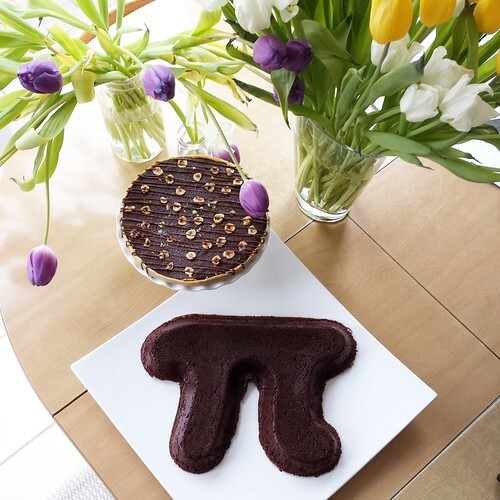 I thought it would be clever to bring a pi-shaped cake to pi(e) day party except I forgot one not-so-minor detail…once I unmolded the cake, the letter was the mirror image of what it ought to be! So much for being clever, sigh. Lucky for me, I easily flipped the photos with handy image editing software so nobody’s none the wiser. Let’s keep this a secret between us, okay? 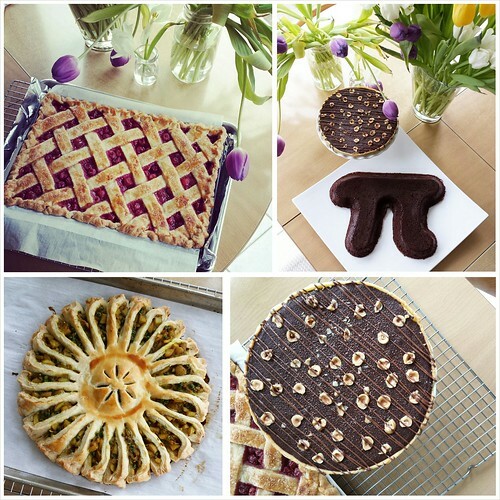 With three pies (and not-pie) already in my basket, I decided an experiment was in order. My final contribution would be a savoury pie based on a photo I saw on Pinterest. As I mentioned a few times previously, Pinterest can be a wonderful source of inspiration or a fountain of disappointment, depending on luck of the draw. 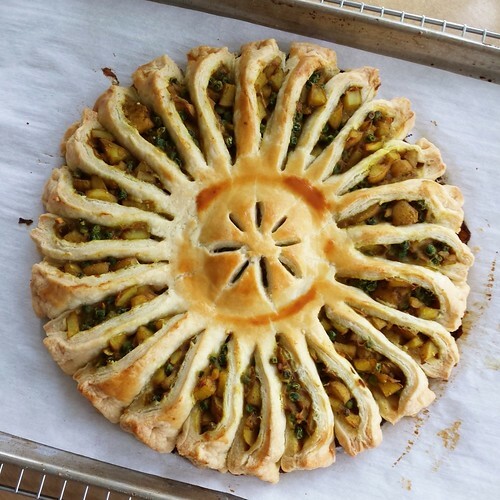 I made a vegetarian samosa filling and sandwiched it between two circles of pie dough. I followed the step-by-step shaping direction and hoped for the best. First, I noticed that sturdy filling without too much liquid worked best to withstand the shaping. Secondly, using an offset spatula to flip the wedges was easy and mess-free. Is there anything an offset spatula cannot do? 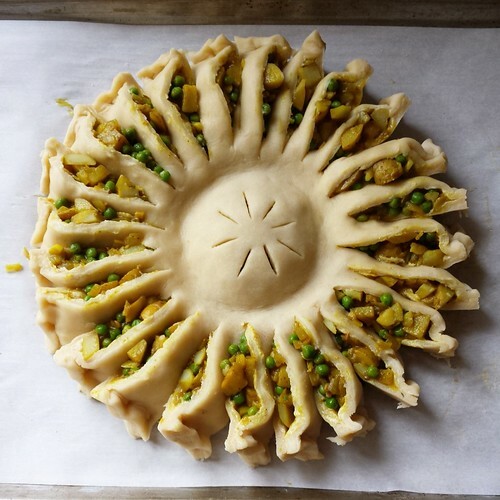 The gorgeous samosa pie baked to golden perfection and held its shape with no trouble. It was stunning to look at but already pre-cut into quick-to-serve pieces. Having said that, it was a lot of crust with not much filling thanks to the inherent nature of its shape. I think it would taste best if served with some tangy mango, tamarind, or mint chutney. All things considered, it was a Pinterest Success. Nailed it! 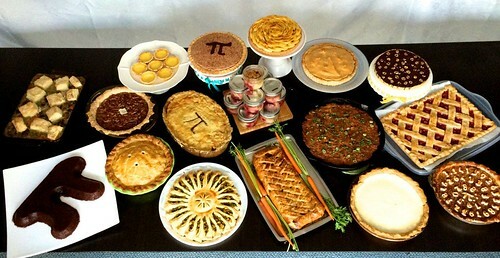 The bar was raised once again this year at Pi(e) Day party with ever more delicious contribution from everyone. It will be hard to top that in 2016. Better start brainstorming now with 11 months ahead of me!